A SOUTH Australian teenager's quest to find her birth father has become a global social media sensation after a photograph of her holding a handwritten plea for information went viral on Facebook. Michelle Trestrail's photo has been shared more than 5100 times - about once every 15 seconds - since she uploaded it to the social networking site on Monday afternoon. In it, the 18-year-old, from Port Pirie, is pictured holding a handwritten sign pleading for information about her birth father, whom she has never met. 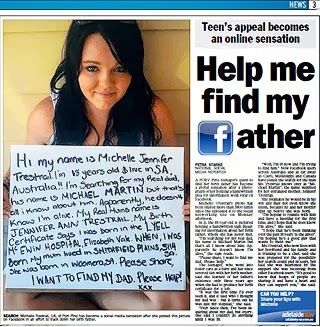 "Teen's appeal becomes an online sensation: Help me find my father", The Advertiser, February 19, 2013.